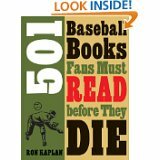 Ron Kaplan’s “501 Baseball Books Fans Must Read Before They Die” is an intriguing title, even if it may not mean much to people other than those devoted to the national pastime. A reference book of this kind was sorely needed for us serious baseball readers, and Kaplan has given us one with this nifty little volume. It’s divided into different chapters depending on the type of book. Kaplan summarizes all kind of books – classic novels such as Bernard Malamud’s “The Natural” and biographies of legendary heroes including Sandy Koufax and Babe Ruth. Kapan isn’t terribly critical, if at all, in most of these summaries. But that’s okay. I give the author credit for putting out a volume that includes so many baseball books, which, believe it or not, really only scratches the surface. I’m happy he included some of my favorites – “A False Spring” and “Shoeless Joe.